Before our friend and renowned artist Dan Campanelli passed away this year, he asked that a raffle be held to benefit historic preservation efforts. His wish was to advance historic preservation while allowing everyone the chance to own an original painting. This is not a print, but rather the original, framed watercolor which has been valued at over $10,000. Dan was an amazing person with incredible talent and passion. 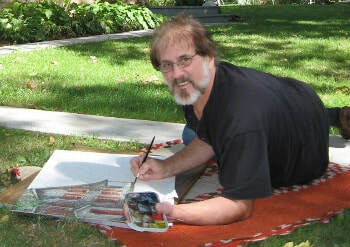 Working first in pencil, then stone lithography, and finally watercolor, his work has been shown in numerous galleries. 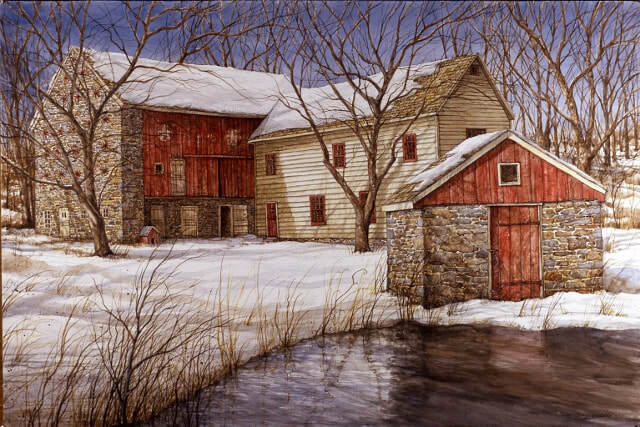 Dan moved to Pohatcong Township in 1976 with his first wife, oil painter Pauline Eblé Campanelli (1943-2001), where he restored a colonial-era stone farmhouse. In 2002 he married Marty Anne Katz, a graphic designer and former art director of country style decorating magazines based in New York. 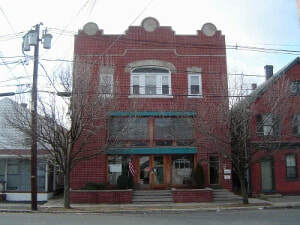 They relocated to another historic stone home in 2005 (being painted in the picture above). Dan continued with his landscape paintings, often producing limited-edition prints as fund raisers for historic sites. This will be the first time an original watercolor is offered as a fundraiser to benefit historic sites. For more on Dan, the full obituary can be read clicking here . an original watercolor by Dan Campanelli. 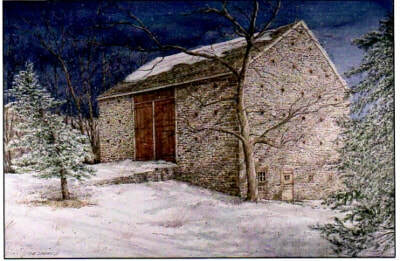 It depicts a Germanic stone bank barn which was the subject of an earlier painting titled "Afternoon Flurries". When he painted "Afternoon Flurries", a stroll around the building convinced him that there was yet another picturesque scene awaiting his brush. There behind the barn was a spring-fed pond and a lovely stone spring house with the "1774" carved into one of the stones. The winter wind blowing over the pond gently rippled the small structure's reflection. The view showed off the barn's pigeon-holed gable end and also revealed a back wall of weathered old red-painted boards, with the remains of designs and lettering barely showing through. A craggy walnut tree cast a late afternoon shadow onto the creamy white clapboard addition to the barn as well. One humorous touch was a tiny doghouse, nearly dwarfed by the huge and imposing barn. Dan decided then and there that he would come back to pain that view as well. Soon on another sunny but wintery day, he ventured forth into the cold country air to start his sketches. Taken by the play on light on the various planes of the buildings, he marveled at the interplay of textures - cool blue and brown stones, softly weathered red barn wood, light-reflecting clapboard, dark mottled walnut bark, shadow-streaked snow, spiky dried grasses, and the sparkle of the sun upon the rippled pond. All of these provided inspiration to Dan as he translated the images first with pencil, and then brush, to create this tranquil moment in time. The spring house, built over two hundred and thirty years ago, today stands silently at the edge of the pond, as a sentinel to the magnificent scene. Dan's watercolor rendition speaks volumes to those who love winter in all its glory - the painting is a tribute and a celebration of winters past, present and those yet to come. The previous painting of the barn, "Afternoon Flurries" © shows the entrance ramp side and gable end, both full of pigeon-hole ventilators. Pat Chiaffarano of "Frame Me"